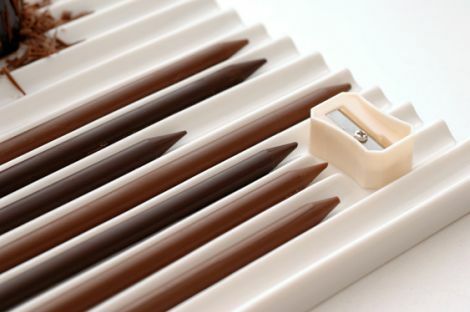 look at these terrific chocolate pencils used for enhancing desserts. they were a creative collaboration between renowned boutique patissier tsujiguchi hironobu and architect oki sako for his company nendo. the set includes chocolate of varying intensity and comes with a special “sharpener” to put as little or as many shavings you like on your sweet treat! someone clever needs to make a (tuile cookie or meringue) dessert that looks like “crumpled” pieces of “paper” that is sitting in a (cookie cup) “trash can” with the shavings sitting on the very top of the pile. or you could just sharpen in onto your cake. whatever works best. sadly, this special item is only available in japan right now. the best place to find it is in one of tsujiguchi’s shops in tokyo. Very cool, I’ll bet they taste as good as they look. Yummy! 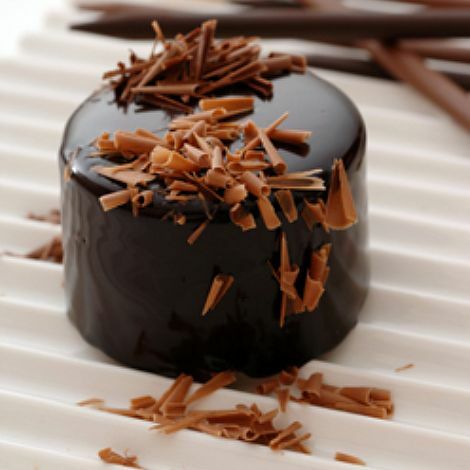 i would like to taste these personally and see those chocolate shops in tokyo too – so cool! aren’t these fun? so simple but so clever.